Thomas Earl Petty (October 20, 1950 – October 2, 2017) was an American singer-songwriter, multi-instrumentalist, record producer, and actor. Petty served as the lead singer of Tom Petty and the Heartbreakers. He was also a member and co-founder of the late 1980s supergroup the Traveling Wilburys, and his early band Mudcrutch. Petty recorded a number of hit singles with the Heartbreakers and as a solo artist. In his career, he sold more than 80 million records worldwide, making him one of the best-selling music artists of all time. 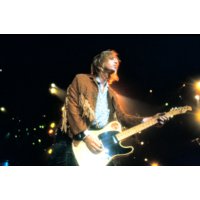 In 2002, Petty was inducted into the Rock and Roll Hall of Fame. He died, aged 66, of cardiac arrest on October 2, 2017.